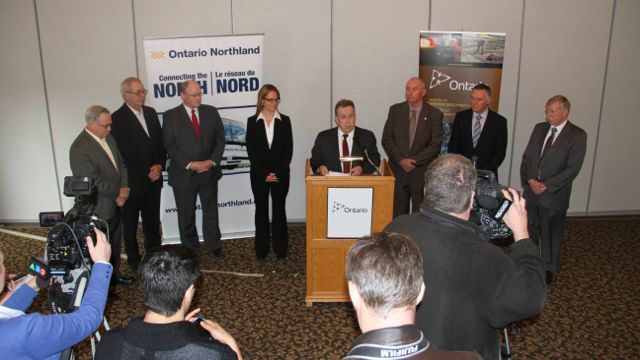 Northern Development and Mines Minister Michael Gravelle addresses the media with new ONTC members by his side. PHOTO BY CHRIS DAWSON. The future of the ONTC is now in the hands of a handful of knowledgable and experience northern Ontarians. Northern Development and Mines Minister Michael Gravelle addresses the media with new ONTC members by his side. PHOTO BY CHRIS DAWSON. The future of the ONTC is now in the hands of a handful of knowledgable and experience northern Ontarians. That news came today as Northern Development and Mines Minister Michael Gravelle officially introduced the new members of the Ontario Northland Transportation Commission which held its first meeting as a group Monday morning. Gravelle, along with a majority of the new committee members assembled at a news conference at the Clarion Pinewood Park on Monday afternoon. ”They will now be at the front end of those decisions so they will be providing advice and guidance and recommendations,” said Gravelle. “We want them to understand the challenge that is underway,” he added. Some have some experience with the commission including locals Steven Carmichael and Ted Hargreaves who have had significant experience with the ONTC. Carmichael was ONTC President and CEO from 2004 to 2010, while Hargreaves had been the ONTC Chair for the past 11 years. While job cuts at the ONR in the past year have taken focus off the growth, Gravelle believes they are moving in the right direction. “The bottom line for us is how can we transform the ONTC so it does continue in a sustainable way including a significant level of employment and providing the services one would expect and provide an even brighter future particularly to the refurbishment division,” said Gravelle. “There are opportunities there if we can position and that division of the ONTC we could be in a very good position. We have 11 new buses in terms of enhancing the motor coach service, we are refurbishing the rail coaches in terms of the Polar Bear Express. However, Gravelle would not deny the possibility of more cuts down the road. UNIFOR local 103 representing 350 employees, is still trying to find equal ground with the provincial government. “Of course the collective bargaining is a crucial process, and I know one that is underway and I was very pleased and impressed with the 5-year agreement that was put in place the United Steelworkers,”noted Gravelle. 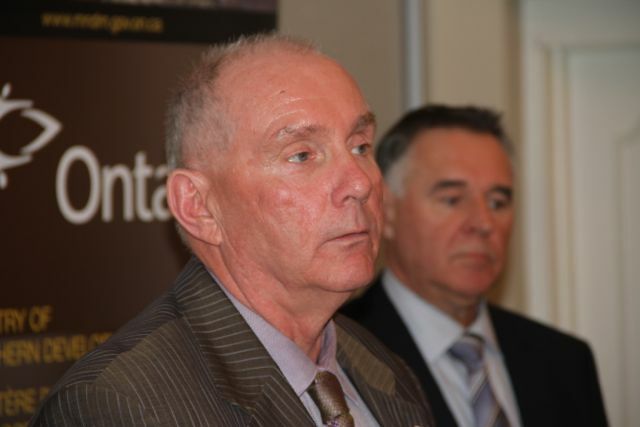 Former Timmins mayor Tom Laughren has taken on the challenge as Commission Chair. “I’m impressed with the working relationships that have been built over the past few months and I’m looking forward to enhancing that,” said Laughren. Other members of the committee include North Bay resident Ewen Cornick, the former VP of administration at Canadore College, Timmins resident Gaetan Mallete, a former VP of forest operations at Domtar, and Sault Ste. Marie’s Ila Watson, an executive at the Sault Ste. Marie Regional Hospital. Watson was the only one not present at the press conference.